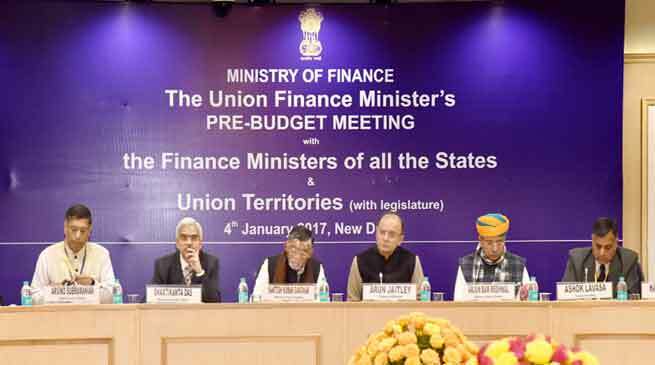 Deputy Chief Minister Chowna Mein who is also the Finance Minister of the state attended pre-budget meeting chaired by Union Finance Minister Arun Jaitley at New Delhi on Wednesday. He placed proposals of the Govt of Arunachal Pradesh before the Union Finance Minister to be incorporated in the Union Budget 2017-18. The meeting was also attended by Union Minister of State for Finance, Santosh Kumar Gangwar, Finance Ministers from various states and Senior Officers from Govt of India. In his speech, Dy CM said, “the strategically located border state of Arunachal Pradesh is lagging behind on the path of development and the biggest challenge before the state is to ensure robust connectivity”. He placed the state govt proposal for railway connectivity along the foothills of the state to facilitate smooth movement of people and transportation of goods. He also placed proposal of 430 kms long double lane east-west highway along the foothills at a total cost of Rs 5244.00 Crs which has already been submitted to the Ministry of Road Transport & Highways by the state govt. Citing it equally important to connect the upper reaches of border areas as the villagers are migrating towards urban settlement, leaving the border areas vulnerable and uninhabited due to absence of good connectivity. He informed the Union Finance Minister that the State Government has prepared a blueprint for construction of a 1841 km long frontier highway which would run parallel to trans Arunachal Highway and would ensure robust connectivity for the remote habitations along the Chinese and Myanmar border. He requested the Finance Minister to place the proposal in priority in Union budget 2017-18 which has an estimated cost of nearly Rs.50,645 crores. Mein also highlighted the vision of the state govt to transform Arunachal Pradesh in to a leading destination for tourist, spirituality and wellness and sought financial help of the centre for massive investment push, world class infrastructure development and global branding campaign to showcase the beauty of this part of India to rest of the world. He also drew the attention of the Union Finance Minister towards available land resource and diverse agro-climatic eco system of the state blessed with bounty of nature in terms of horticulture and agricultural produce and has a special place in global bio-diversity map. He said, “the state is richly endowed with medicinal plants, rare Orchids, Kiwi, large Cardamom, Apple, Quinoa, Orange apart from Tea, Rubber, Coffee etc which can compete with the best agri-horti produce anywhere in the world” and sought the strong support from the Govt of India to transform Arunachal Pradesh in to a fully organic state through strong investment push in the entire agricultural value chain including cold chain and storage facilities, agri-marketing, agro processing and exports. The Minister also sought a Special Package for Industrial incentives for Arunachal Pradesh, which will help catalyze flow of private investment in the State. “The Special Package is required to provide incentives to private entrepreneurs to invest in the state”, Mein said. He also sought Central Assistance for creating Greenfield Industrial Estates (IEs) and Industrial Growth Centers (IGCs) with common facilities and infrastructure. He sought to increase the Central Assistance to Rs 40 Crore per centre with at least one Growth Centre in each district of the state. He asked for setting up a Directorate of Micro Small and Medium Enterprise (MSME) in Arunachal Pradesh, which could serve the entire north eastern region and allow small businesses and local entrepreneurs adequate handholding support. He also proposed to incorporate 100% financial assistance for setting up a Food Park in Arunachal Pradesh to cater to the Horticultural food production of the State. With a view to infuse a culture of entrepreneurship and reduce the excessive dependency on Government employment, he also seek to set up an Enterprise Resource Center in the state to serve as a nodal body for facilitating the start up business and help in effectively implementing various schemes introduced by Government of India such as MUDRA, in coordination with the Banks. Dy CM also sought for establishment of a world class skill development institute in Arunachal Pradesh which would cater to the requirement of all North Eastern States saying that the youth of the State are aspirational and want to make their contribution in nation building but the serious lack of capacity building in the whole range of skill sets make them inadequate to face competition which is a challenge faced by all North Eastern States. He further sought for establishment of a world class residential sports facilities in the state by citing that the hill tribes of Arunachal Pradesh have traditionally been athletic by nature and agile in physique but due to absence of high quality sports infrastructure, the energy of the youth could not be channelized and unable to tap the hidden potential. He said that the establishment of residential sports facilities would cater to need of the youths and would be a part of Indian Olympic dream.